An Area chart shows the data as continuous lines that pass through points defined by their items' values. The portion of the graph beneath the lines is filled with a particular color for every series. As Figure 1 shows, colors in an Area chart can be useful for emphasizing changes in values from several sets of similar data. A colored background will clearly visualize the differences. An Area chart emphasizes the volume of money, data or any other unit that the given series has encompassed. When backgrounds are semi-transparent, it lets the user clearly see where different sets of data overlap. The sample in Figure 1 (which is generated by the code in Example 1) shows sales data — the expenses and revenue generated by the sales effort. For example, such a chart could easily let management see where/when there are issues and the company's sales are not meeting performance goals. Figure 1: A basic Area chart. Example 1 shows the markup used to create it. As of Q1 2014, you can use spline curves and step-like progression to render an AreaSeries. This can provide more suitable visualization according to the type of data that is explored. The following list shows the most common areas and elements of the Area chart that you can modify. To explore the full list of options, start from the Visual Structure of the RadHtmlChart Control’s Tag Hierarchy help article. The fill color of each series is controlled via the BackgroundColor property of the AreaSeries > Appearance > FillStyle inner tag. The width of the line in each series is controlled via the Width property of the AreaSeries > LineAppearance tag. The position of each item on the y-axis is controlled by its Y property of the CategorySeriesItem and each CategorySeriesItem is placed with regard to one AxisItem on the x-axis. Each item can have a label and a tooltip that follow the common pattern defined in the DataFormatString property of the LabelsAppearance and TooltipsAppearance sections of the series.The format string uses the Y of the item. You can create more complex content via the ClientTemplate of the tooltips and labels. The markers are fully customizable — the type, background color, size, border's width and color can be controlled respectively through MarkersType, BackgroundColor, Size, BorderWidth and BorderColor properties, exposed by the AreaSeries > MarkersAppearance tag. The axes are also fully customizable — the y-axis automatically adjusts the scale to accommodate the data that comes in, and for finer tuning, there are numerous properties that can change each aspect. Directly in the axis tag you can use the tag's properties to control color, major and minor tick types and sizes, minimal and maximal values for the y-axis (plus a step size) whereas the x-axis requires a set of items to match the number of CategorySeriesItems the series have. This tag is also the place where the crossing value with the other axis can be set (the index of an item for an item axis) and whether the axis will be reversed. If some values are missing (i.e., they are null/Nothing) from the series data, you can have the chart work around this by setting the MissingValues property of the series to the desired behavior: interpolate, missing or gap. The title, background colors and legend are controlled via the inner properties of the RadHtmlChart control and are common for all charts.You can find more information in the Server-side API and in the Element structure articles. Example 1: The code that creates the chart from Figure 1. 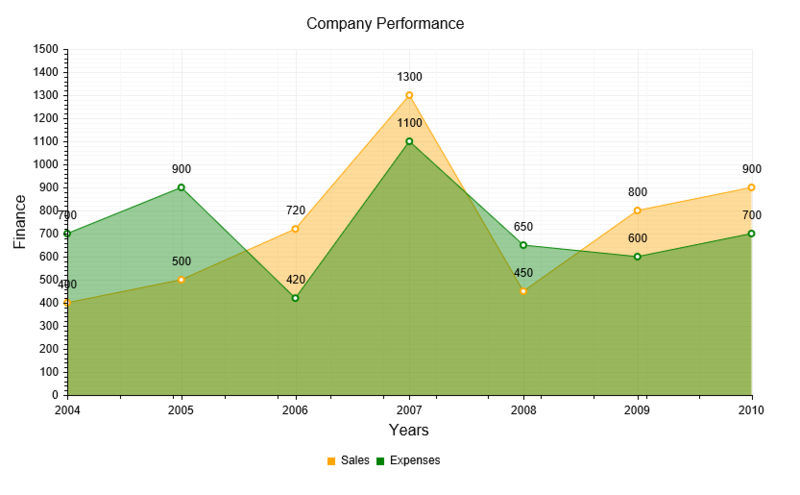 It shows a simple comparison between the sales and the expenses of a company.